If you wanted to sabotage alternative energy development and misdirect any interested individuals, while simultaneously creating the illusion of progress in solving the energy crisis, how would you go about doing it? One very good method would be to covertly fund so called alternative energy experts, who would setup websites and publish books. All of which would be filled with impressive sounding scientific information, and pictures of devices that almost (but never quite seem to) work. There would be dozens of these websites, all interlinked with each other, thereby creating the illusion of a vast network of individuals and organizations, tirelessly working to solve the world's energy problem. These individuals would also organize conferences and seminars, where for a small admission fee, the public could learn about the latest breakthroughs in alternative energy. And of course there would be books... Lots and lots of books. Each one full of information, and promising that a breakthrough is just around the corner. In point of fact, the "breakthrough" took place over one hundred years ago, and what you're witnessing today is a immense disinformation campaign, perpetrated on a scale so vast, its almost unimaginable. The following is an exposé outlining the connections between some of the most high profile individuals in alternative energy, and the corporations that are covertly backing them. Mr. Bearden is an acknowledged leader in the field of alternative energy. He holds the patent on a device called the "Motionless Electric Generator" or MEG. 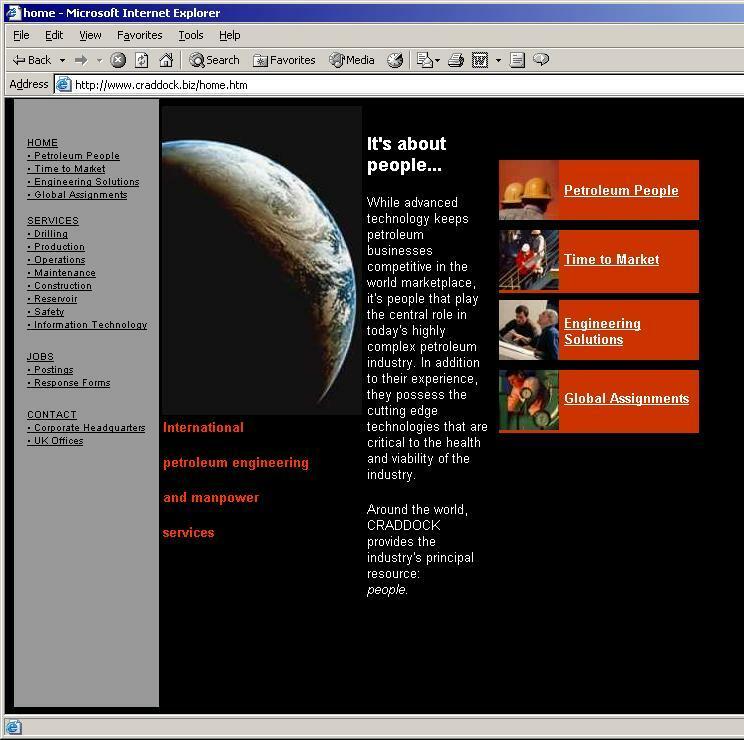 His website shows pictures of a MEG prototype, and he sells copies of his many books and DVDs. Lets take a look behind the scenes and see who owns Tom's website. There is a widely available internet tool called "whois" that allows anyone to lookup the website registration. In other words, to lookup who owns the website. 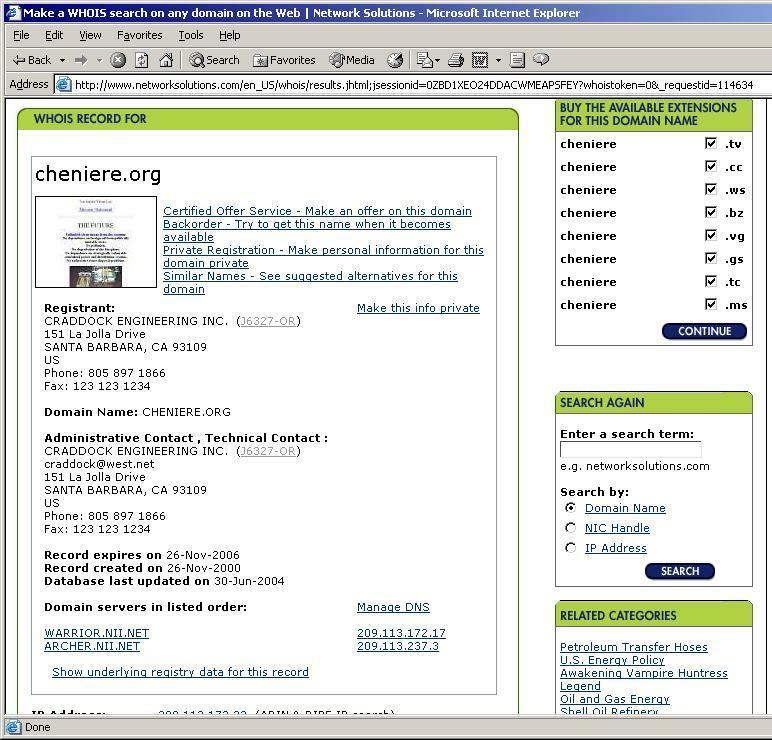 The Tom Bearden website is www.cheniere.org and a screen capture of the website registration is shown in figure 1 (below). Every state government has an office known as "The Secretary of State", and this office has public records of all businesses located within that state. 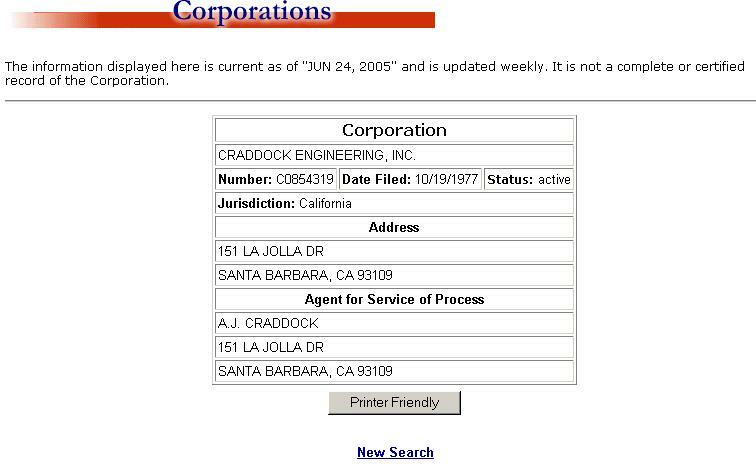 Figure 2 shows a screen capture from the California state business records for Craddock Engineering Inc. Notice the address matches, so this is the right record. And according to this record, Mr. A.J. Craddock is the registered agent for Carddock Engineering. We still don't know what Craddock Engineering does, so lets do a Google search and see what we can find out about this corporation. 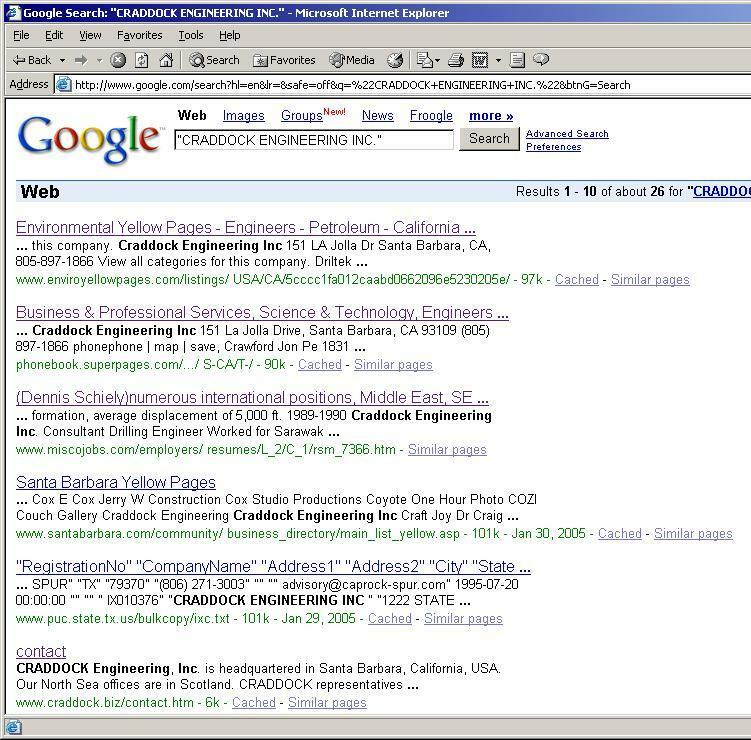 Figure 3 shows a screen capture for the search term "Craddock Engineering Inc."
What??? International petroleum engineering and manpower services!!! There must be some mistake. Lets do a whois lookup on craddock.biz and make sure we have the right website. 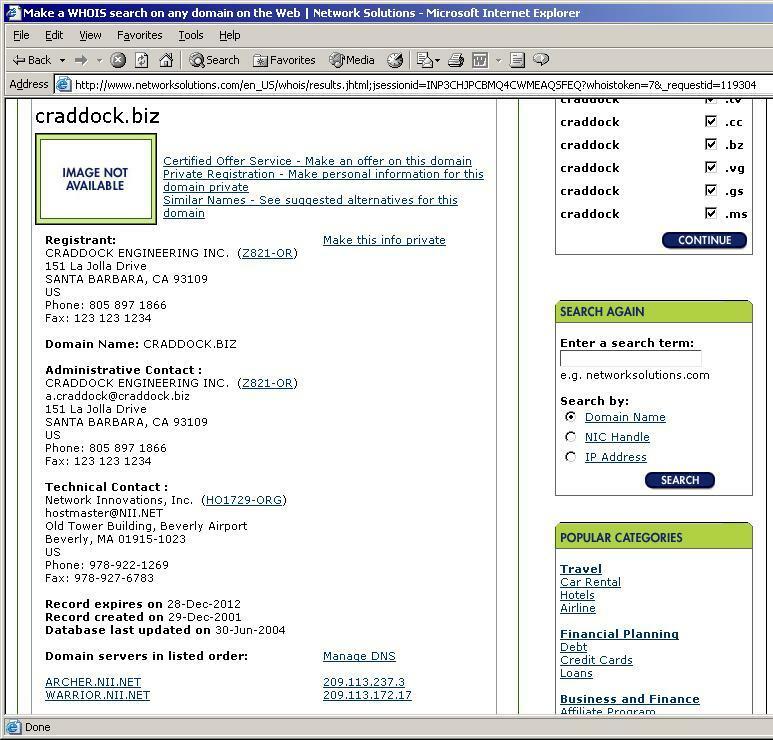 Figure 5 shows a screen capture for the whois registration of craddock.biz. No mistake here... The Craddock Engineering Inc. website registration clearly shows the SAME street address as Tom Bearden's website registration (figure 1 above). In other words, Tom Bearden's website is owned by an international oil field services corporation! 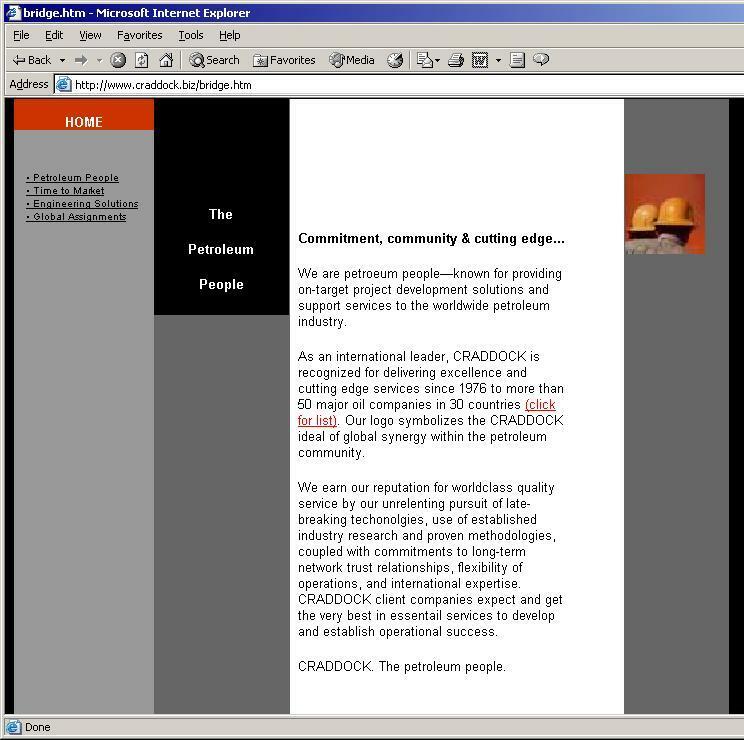 Clicking on the "Petroleum People" link brings up the screen capture shown in figure 6. And in figure 6 they boast of delivering "cutting edge services" to "more than 50 major oil companies in 30 different countries". They have a list of clients which includes such notables as Shell Oil, British Petroleum (BP - of gulf oil spill fame), ARCO, Conoco, Texaco, even the Saudi Arabia state owned Aramco oil company. It seems Mr. Bearden has some very powerful patrons! Now why do you suppose an oil field services company that does business with the who's who of the petroleum industry, also owns the website of someone who is supposedly an acknowledged leader in free energy, and an outspoken critic of the oil industry? What better way for the petroleum industry to covertly channel money into the active subversion of alternative energy? Obviously, Mr. A.J. Craddock (fig 2 above) deserves closer scrutiny. And after doing a little digging around in the Usenet news groups we find an email address "craddock@west.net" that seems to belong to both A.J. 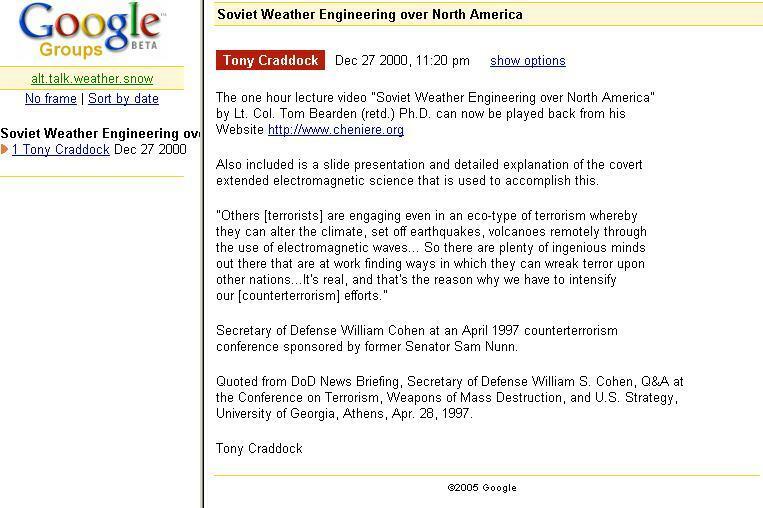 Craddock and Tony Craddock, see screen capture figure 7 (below). Notice the last search hit mentions Tom Bearden, so lets take a look at this posting. 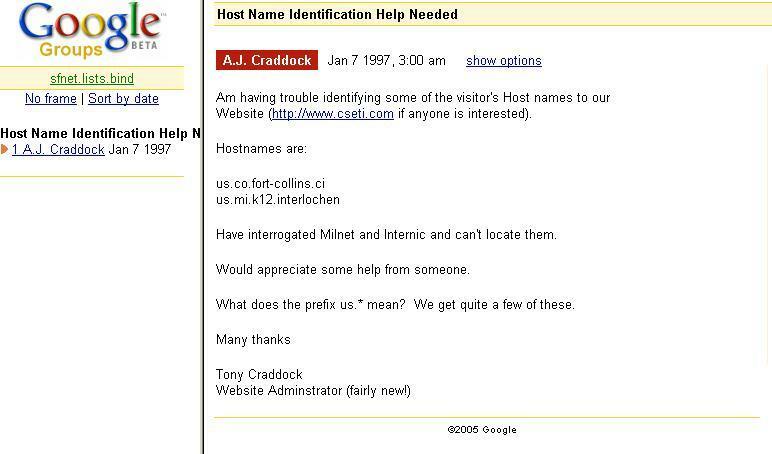 The screen capture in figure 8 shows the contents of this posting, including a link back to Tom Bearden's website (cheniere.org), so we must have the right Mr. Craddock, even though he's using the name "Tony Craddock" rather than "A.J. Carddock". This posting is also very revealing since it quotes government sources and seems to advocate increased government counter terrorism efforts. And even more interesting, the posting is dated December 27, 2000. Less than one year before the 9-11 attacks which were used to justify the Iraq (oil) war. Hmmmm... This just gets better and better. Next, lets take a look at another Usenet posting, this one by A.J. Craddock. Dr. Greer is the founder of the Center for the Study of Extraterrestrial Intelligence (cseti), the Disclosure Project, and the Orion Project. CSETI trains people to become ambassadors for extraterrestrial contact, the Disclosure Project seeks to persuade congress to hold hearings on the UFO/extraterrestrial presence on and around the Earth, and Project Orion is developing "Clean Energy Solutions to Empower the 21st Century". Even though the A.J. 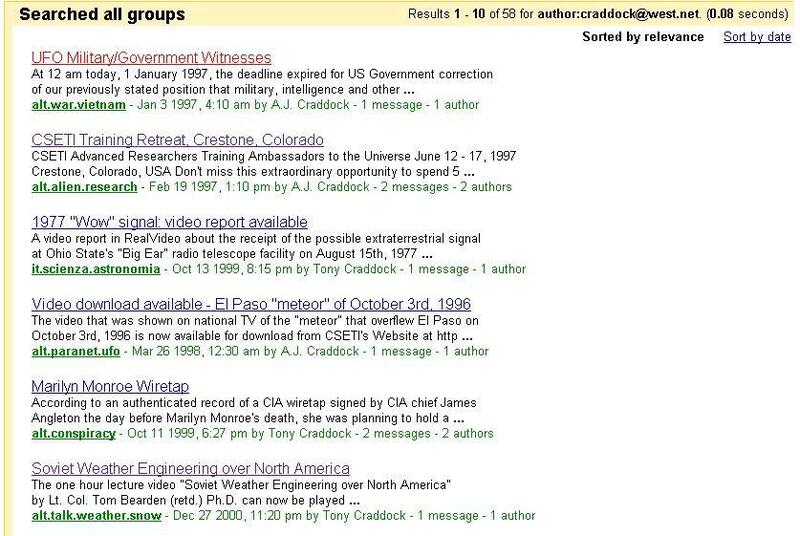 Craddock post is linked to the cseti website (fig. 9 above), lets concentrate on the Project Orion, since this essay is primarily concerned with energy, and this site is supposedly developing alternative energy. 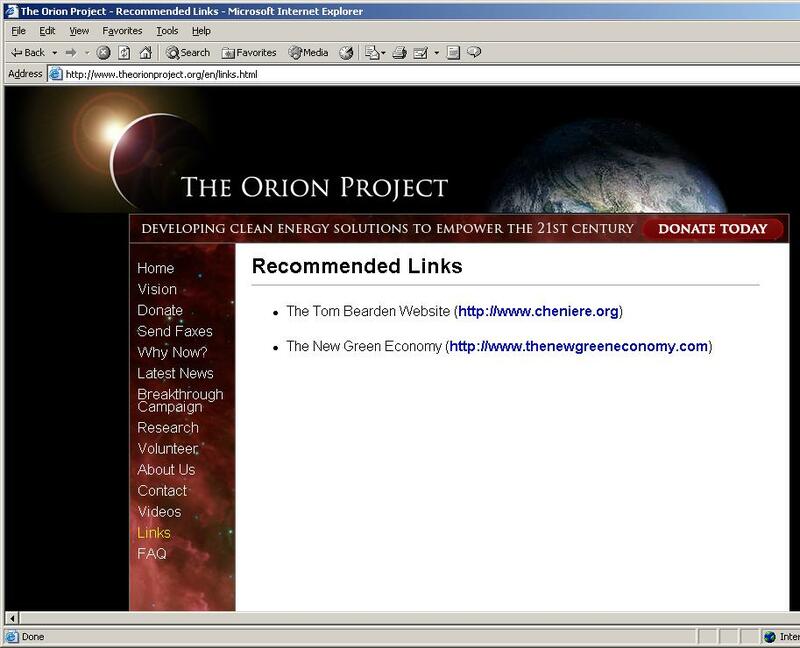 Figure 10 is a screen capture of recommended links page from the Project Orion website. What a surprise! He recommends cheniere.org, Tom Bearden's website. From the "Breakthrough Campaign" page we discover Dr. Greer is searching the world for the best alternative energy inventors, and he's asking for $3,000,000 in donations to build a laboratory for developing these inventions. Of course this isn't the first time Dr. Greer has gathered together a group of inventors to solve the worlds energy crisis. 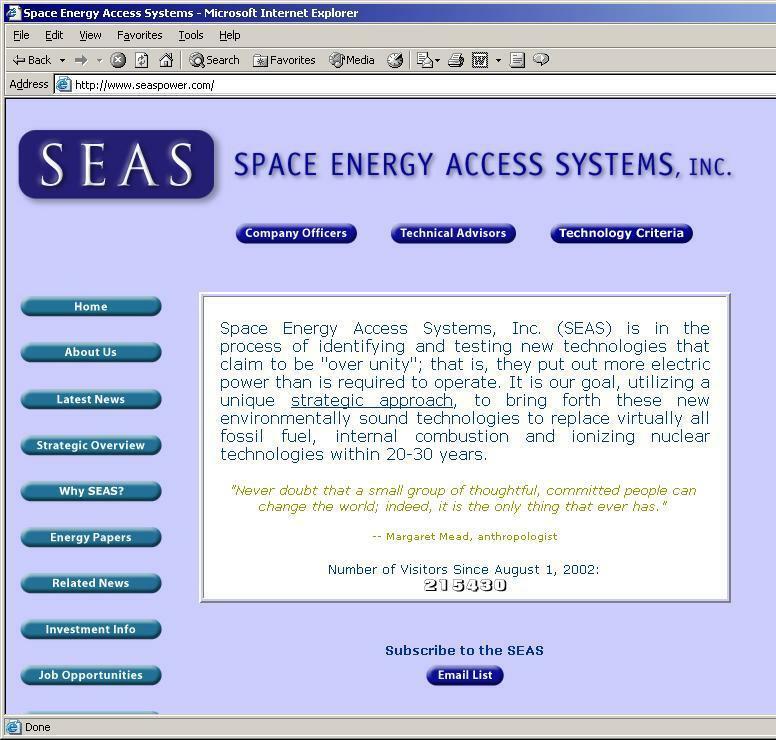 His previous attempt was the now defunct seaspower.com (space energy access systems), shown in the screen capture figure 11 (below). You can also read all about his plans for the future at the following link. Another interesting confluence between Steven Greer's current Project Orion, and his previous seaspower.com is the list of scientific papers and contributors. Figure 12 shows a screen capture of the list form seaspower.com website. 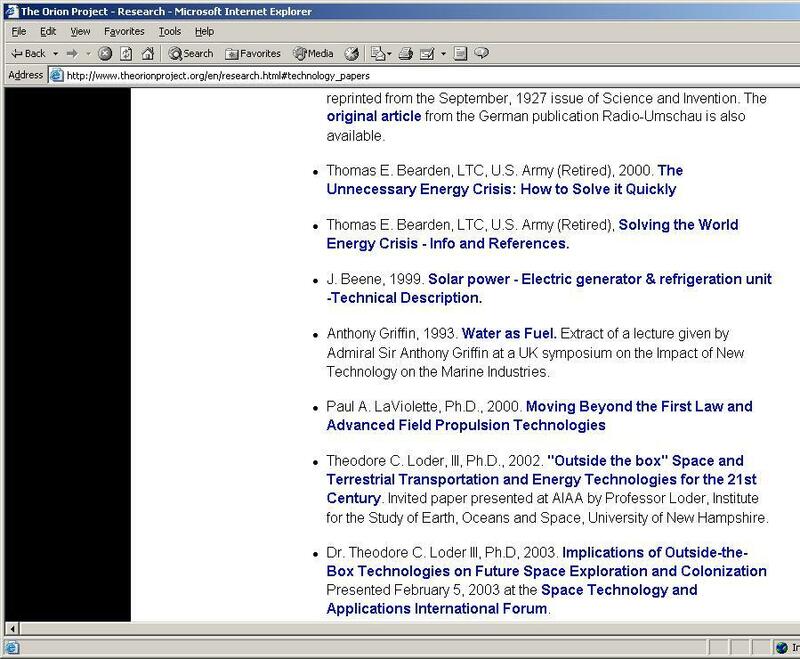 And figure 13 shows a screen capture a partial list from the Project Orion website. Among those contributors who are common to both website lists are Tom Bearden (no big surprise there), Paul L. LaViolette, and Theodore C. Loder. 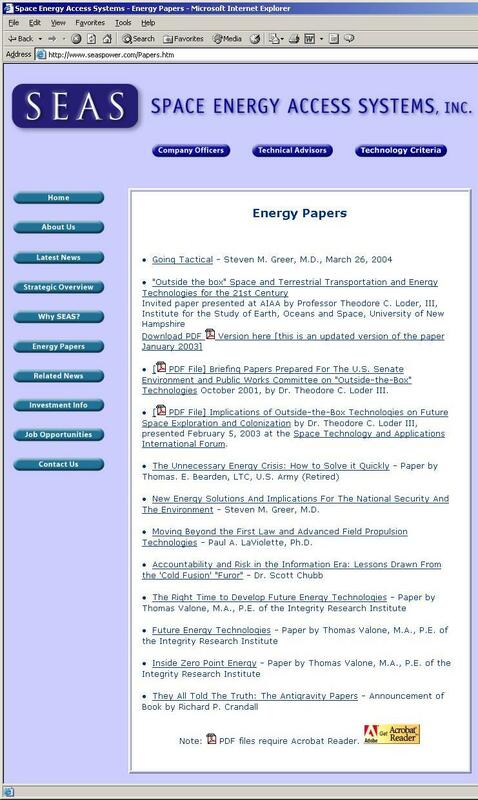 So 8 years after Steven Greer first started seaspower.com, he's still citing many of the same research papers, and he's still searching for alternative energy inventors. In this essay, I've outlined the connections between Tom Bearden, Steven Greer, A.J. Craddock (AKA Tony Craddock), The Orion Project, and Craddock Engineering. If we assume these people and organizations have no real interest in seeing alternative energy become a commercial reality. Then we must also assume that any other individuals or organizations that are favorably mentioned and/or actively promoted by them are at the very least, incapable of making any real progress in commercializing alternative energy. This list would include but is not limited to: Myron Evans, Tom Valone, Paul LaViolette, The AIAS, and Integrity Research Institute. Among these, the most interesting is the Integrity Research Institute, based in Washington DC and presided over by Tom Valone. Mr. Valone seems to have taken the old school (prestige) approach in selecting the board of directors for his organization. Many of his advisers are ex-government functionaries, bureaucrats, and scientists from FEMA, DOE, and the DOD. Another website intimately connected to those listed above is NEM (newenergymovement.org). Their board of directors includes Tom Valone, and their list of conference speakers includes both Steven Greer and Tom Valone. Under the list of resources, the website links page includes our old friend Tom Bearden. All of these individuals, and many more left unmentioned, work tirelessly to create the illusion of progress in solving America's growing energy crisis. They sell a vast panoply of books, pamphlets, and DVDs. Each one overflowing with allegedly useful information, and yet completely devoid of any meaningful solution. They hold countless seminars, conferences, round table discussions, and conventions. Each one populated from a constantly revolving list of scientists, consultants, and industry experts. All of whom pontificate for hours on end without offering any practical solution.